The people in the city of Philippi who received this letter from their friend, Paul, were suffering from two of Christianity's greatest adversaries: self-sufficiency and complacency. While writing this letter from a Roman prison cell, Paul was able to provide a unique perspective on these enemies of our faith, for even as he faced horrific trials, Paul continued to encourage his brothers and sisters by declaring that his imprisonment was reason for joy. 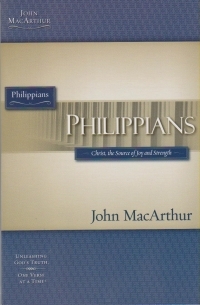 MacArthur Study Guide Series provides a twelve week, verse-by-verse examination of the books of the New Testament and thought-provoking questions with space provided for note-taking.